The best kind of relationships are often like the finest whiskies – two wholly different personalities blended into an integrated whole that’s even better the sum of its component parts. If he had met them, the great philosopher Aristotle would definitely have used that phrase he coined on these power couples – some visible, others less so – in Singapore’s whisky and nightlife scene. 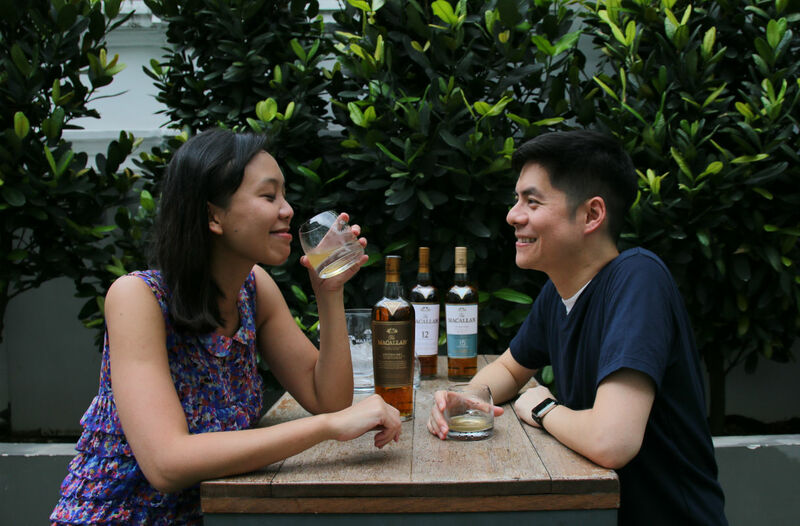 We talk to four couples who have made their mark in Singapore’s whisky/whiskey industry about what makes them tick, and how they’ll continue to influence our whisky drinking habits. Matthew Fergusson-Stewart and Elaine Seah. One of the most visible brand ambassadors in Singapore as the official face of Glenfiddich here in Singapore, Matthew Fergusson-Stewart has been so good at his job – last year he landed the Whisky Magazine’s Icons of Whisky (Rest of World) Scotch Whisky Brand Ambassador of the year award – you’d never think he started his career in the finance industry. But he did get into whisky when he become involved in the Scotch Malt Whisky Society as their state manager in Western Australia – his first real association in the whisky business. Matthew first met Elaine Seah through a former colleague who studied in university with her. And despite the distance they would pursue a relationship, until he decided to quit his job and move to Singapore to be with Elaine. Matthew also then decided that he will pursue full-time work in the whisky industry as opposed to the finance sector which he hated. He would land at Auld Alliance where he continued to hone his whisky expertise, and where he got spotted by William Grant & Sons for the ambassadorial role for its top-selling Glenfiddich brand. “Without Elaine’s support in those early years, I never would have ended up as the Glenfiddich Brand Ambassador for APAC,” Matthew muses. Much less visible is his far more petite half. But those who know will be aware than the pint-sized Elaine is founder of public relations firm Brand Inc that’s behind many editions of Singapore’s leading annual spirits fair Whisky Live. Her first taste of a single malt may be the Talisker 18YO Matthew had offered her during a mutual friend’s wedding those many years ago, but her whisky expertise has blossomed since – not surprising when she gets to work with whisky luminaries the likes of Dave Broom, Michael Urquhart, and Thierry Benitah. Through sheer professionalism and Matthew’s guidance, she would help grow the initial number of 400 guests at the first Whisky Live in 2010 to a turnout of more than 3,000 for the 2016 edition. “She always had a superb nose and palate for whisky; in fact, so much so I’m often a little jealous,” he complains. If so she certainly would have appreciated the 31YO blended whisky made by Euan Shand – founder of Bennachie Scotch Whisky Co as well as co-owner of Duncan Taylor Scotch Whisky Limited – Matthew sourced for their own wedding. Fortunately for Matthew and Elaine, while both their work involves whisky they don’t work so closely enough to run the risk of having work disagreements invading their home. “We get to share knowledge and ideas about whisky, and how to do better in the whisky industry, while still being able to map out our own careers”, Matthew shares. “Though whisky will always be Matthew’s mistress, it was also whisky that got us together,” Elaine states matter-of-factly. And it was also whisky that led the couple to name their first-born daughter Islay, after the Scotch whisky region both loved so much during their honeymoon. “Recently, Islay asked why her name was on a bottle of Bowmore, which we found rather amusing,” Elaine laughs. Howard Lo and Lim Hui Nan. If you find F&B entrepreneur Howard Lo vaguely familiar, the then technology geek was actually featured as one of the suitors in dating reality television show “Eye For A Guy” back in 2005. The enterprising young man later opened the first outlet of his Standing Sushi Bar chain in Raffles Place at a tender age of 32 years old, and that was where he met Lim Hui Nan, who was a regular at the sushi joint. “I was working there frequently as a waiter, cashier, and dishwasher,” he remembers, “(and) since Nan was a regular there, we were talking frequently with each other.” One day he plucked up the courage to ask her out for a drink, then more drinks, and that soon developed into something more serious. Their first experience with whisky started with Nan. Howard was more interested in sake then, but Nan happened to attend a whisky tasting seminar and food pairing session, coincidentally led by Matthew Fergusson-Stewart, and one day asked Howard along for one of the talks. He was hooked. The couple started visiting whisky bar Auld Alliance regularly to sample their way through the whiskies of Scotland. “With whisky, the more you start loving it, the more you realise you have to learn,” Howard muses. In early 2013, the couple was planning for a restaurant bar in Raffles Place when they visited the United States. Throughout their visit they would continually notice locally-produced handcrafted spirits behind the bar or on menus; by the time they finished tasting through Distillery Row in Portland, Oregon they knew they had to bring some of those spirits in. Thus began spirits distribution company Liberty Spirits Asia, and the restaurant bar would be The Secret Mermaid, making cocktails using those craft whiskies, gins, vodkas and other spirits the former brought in. “The most romantic thing (Howard) ever did was to start Liberty Spirits Asia so that he could import my favourite whiskeys from that trip,” Nan laughs. “I think I would have considered just buying that one bottle via airmail rather than found a liquor import and distribution company,” he replies, in semi-jest. He does think the most romantic thing he’s done was weave together a night through a series of bars in Washington DC that involved letting her drink all the rare Pappy Van Winkles to her heart’s content. “Seven years on, it is still nice to know that we have played instrumental roles in budding college romances – our chefs at Standing Sushi Bar are extremely adept at arranging salmon sashimi in the shape of a heart now – aided in making a night extra memorable, or made that single regular at The Secret Mermaid feel a little less alone on this day,” she adds. We’d like to think that while Howard didn’t get dream girl popular MTV VJ Denise Keller on “Eye For A Guy” back then, he did better. Far better. Indra Kantono and Gan Guo Yi. 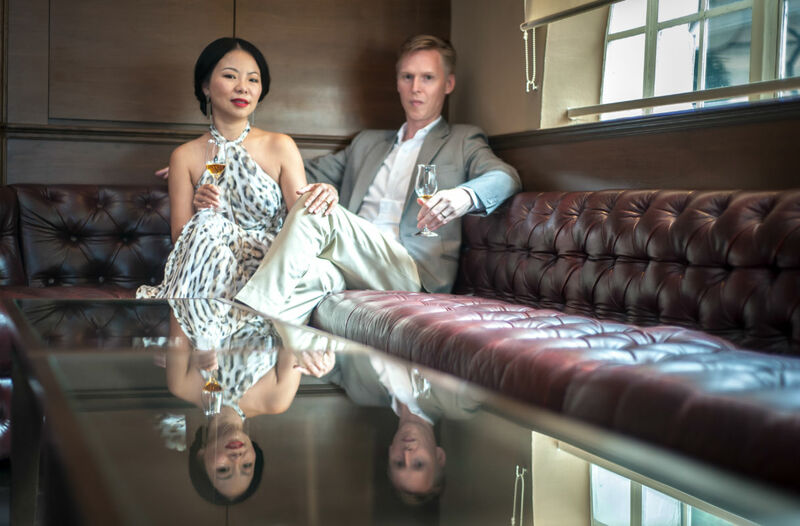 Indra Kantono and Gan Guo Yi’s love affair with whisky, and each other, began with cocktails. The pair first met at Ice Cold Beer on Emerald Hill in 2009, when the latter first invited Indra and his colleague – an acquaintance of hers – to join her and her air stewardess friends when the guys couldn’t find a free table at the crowded bar. Who could say no? That initial friendship soon blossomed into something more serious, in their personal lives as well as setting the stage for one of Singapore’s home-grown hospitality groups. Over the next couple of years both would spend evenings and weekends experimenting with classic cocktails at home, playing host to friends and friends-of-friends over multiple drinking sessions. Guo Yi, who was flying with Singapore Airlines, would travel around the world hunting for unique spirits and liqueurs to use at those weekend jaunts, and scouring mom and pop shops across various cities for rare bottles such as Buffalo Trace Antique Collection to the likes of George T. Stagg and Thomas Handy Rye. By the end of 2011, Indra and Guo Yi felt they were ready to open a bar. Guo Yi quit her job to search for a venue to start Jigger & Pony, which would be the first cocktail bar in Singapore that would fully focus on classic cocktails. The bar opened mid-2012, and Indra would quit his finance job to join her full-time. And all this took place before they even got married. Just as their love blossomed, so did their business grow. Jigger & Pony would gain a sibling in rum bar Sugarhall next door in 2014, followed by cocktail joint Gibson, oyster bar Humpback, and whisky dive Flagship a mere year later. There are challenges, of course, when there’s no escape from gloom and dilemma as tough business decisions need to be made, and when issues invade dinner chats and bedtime pillow talks. “(But) when we accomplish something, it is a shared accomplishment that makes us both tingle. There’s nothing better than toasting that success with someone you love, who together have built the business,” he says. 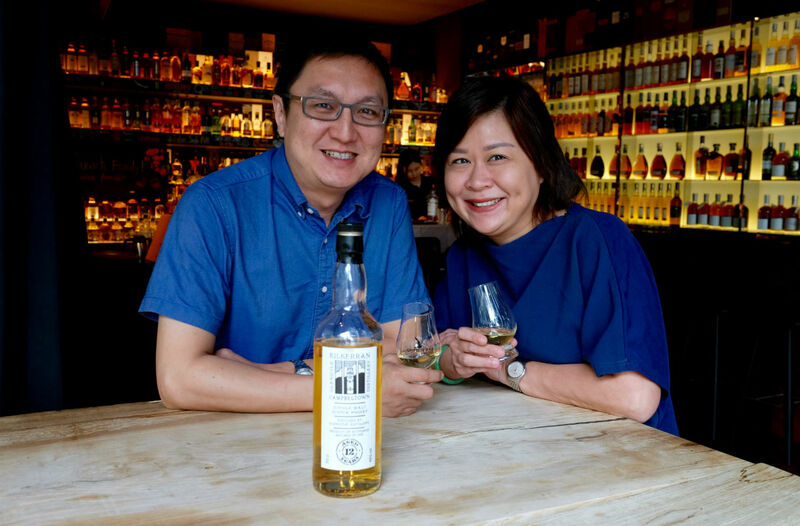 To celebrate their third wedding anniversary, Indra and Guo Yi managed to score the Compass Box Three Year Old Deluxe, created by their favourite whisky blender of all time John Glaser, when stocks arrived in Singapore exactly three days before their dinner date. “I like to think that John Glaser planned it all for us,” says Indra. Being in the hospitality business also means that both Indra and Guo Yi tend to be working full-time at their bars during busy nights like Valentine’s Day. “We share the same passion for hospitality every day through our venues, and it feels amazing when other couples and lovebirds choose our bars and restaurants to celebrate Valentine’s Day in,” adds Guo Yi. Chua Khoon Hui and Joyce Ng. Chua Khoon Hui first laid eyes on Joyce Ng when he was an auditor and she an accountant at a technology company he was inspecting. At that time he probably never would have believed that together they would some years later become one of the pioneers of Singapore’s then emergent whisky bar scene. They would get together, bonded by love and a shared dream to one day own their own business. That dream first started as a cafe in the Central Business District in 2001 so that Joyce could pursue her interest as a budding pastry chef. And because the building that housed their cafe also hosted the Belgian embassy, the cafe would stock a wide variety of Belgian beers to cater to the expected crowd. Soon the cafe’s beer business boomed, far outstripping sales for pastries. Their love for whisky first started when they purchased the entire remaining stock of vintage Bowmore – circa 1980s in ceramic bottles, no less – which nobody wanted at a bargain basement price off a distributor. At that time they knew nothing about whisky; the couple proceeded to drink much of it, as well as selling the whisky cheaply at their cafe. Which, we assume, they wouldn’t have done if they knew then like they do now what the value of those whiskies would become today. They would later sell off that cafe. But their defining moment with whisky was when they went on a trip to Scotland in 2005 to visit various whisky distilleries. Because money was tight and the exchange rate brutal at that time, the couple survived on fish and chips every day. “It was the cheapest meal available,” Joyce says. The contacts made during the trip proved invaluable when Khoon Hui and Joyce decided to start importing and distributing whiskies in earnest. They started a retail kiosk at Tanglin Mall later that year selling whiskies such as Bowmore and a range from independent bottlers Gordon & MacPhail. They moved again to Cairnhill in 2006, and finally settled down with Quaich Bar at Grand Copthorne Waterfront. That flagship outlet still exists today, and will celebrate its 10th anniversary this year. A second Quaich Bar outlet was recently opened at South Beach too. Disagreements over business would be part and parcel of the relationship. Opening up an ill-fated outlet on Sentosa, for example, was a sore point. “There can be a lot of ‘I-told-you-so’ when something goes wrong,” Khoon Hui rues as he cast a glance at Joyce, drawing a laugh. The couple plans to do nothing for Valentine’s Day. “Maybe we next year we can go pick a cask each and blend them together for a special bottling?” Khoon Hui asks Joyce. Her face lights up. Looks like another trip to Scotland is on the cards.